Do you need better utilisation of your assets? For those looking to achieve optimal efficiency through a variety of inputs Job Schedulr from our Intelligent Operations Platform is a SaaS tool, to manage large disparate teams. 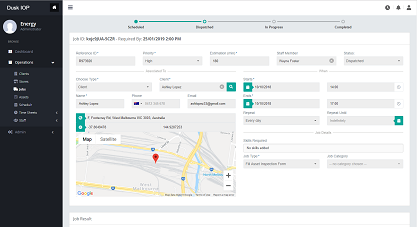 It helps streamline the field service management process from end-to-end and includes scheduling, online booking, work order management, estimating, dispatch, routing, GPS, CRM integration, optimisation, quoting, invoicing, payments, reporting, and more all accessible over the internet from any desktop or mobile device. With full calendar scheduling software, this hub of information provides a holistic view of the workforce, enabling management, forecasting and scheduling to mobile users in the most optimal way. Real time field data is sent back in to the Job Schedulr providing visibility on the job status and the user. Reporting functions, analysis and planning for long term work can all be undertaken using the Intelligent Operations Platform. Regular maintenance can be troublesome and costly. Significant system downtimes, affecting performance. Limited reach and higher workloads. Lack of scalability & visibility. Job Schedulr provides a comprehensive solution to help organisations to manage the field service. Job Schedulr also includes the function to send and receive messages from the field which enhances filed communication and promotes feedback. Job Schedulr offers significantly better integration and scalability. It is uniformly easy to set up/install and maintain. Job Schedulr is an out-and-out user-oriented tool. You can easily perform detailed Proofs-of-concept (PoC) with it. Job Schedulr enhances communications for superior field service management. Information visibility levels are boosted – and key tasks like GPS & routing, work order management, quoting & invoicing, CRM integrations, scheduling and others become considerably easier and streamlined. Job Schedulr comes with high guaranteed levels of service, robust security standards, quick deployment options and data recovery feature. Our tool helps you get the most out of your business assets. Want to improve your scheduling and optimise your teams?